Wet. Floodplain forests, borders of coniferous swamps and bogs. Full or partial sun. This is a moderately slow-growing deciduous tree. In Minnesota mature trees are usually 30′ to 50′ tall and 12″ to 24″ in diameter at breast height. Large individuals can reach over 80′ in height and 38″ in diameter. It is a moderately short-lived tree. 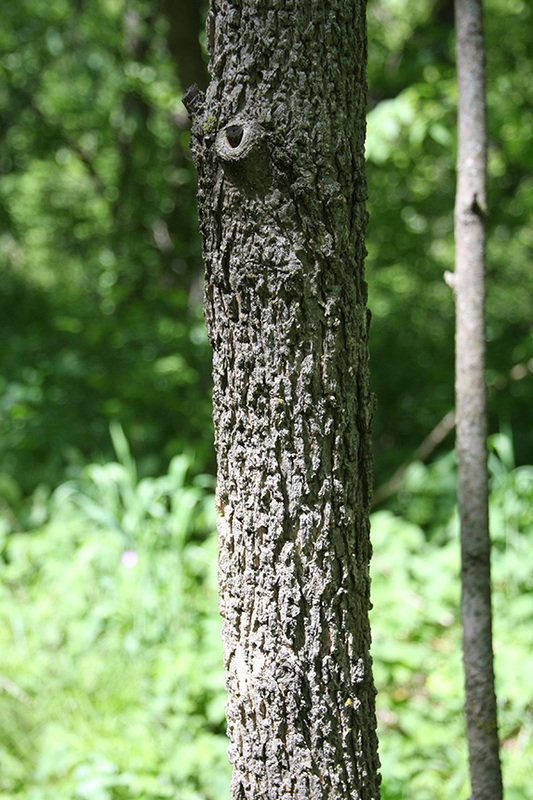 The trunk is slender and often leaning or crooked. It rises from a shallow, wide-spreading root system. The crown is narrow, open, and slightly rounded. The branches are stout, short, and ascending. 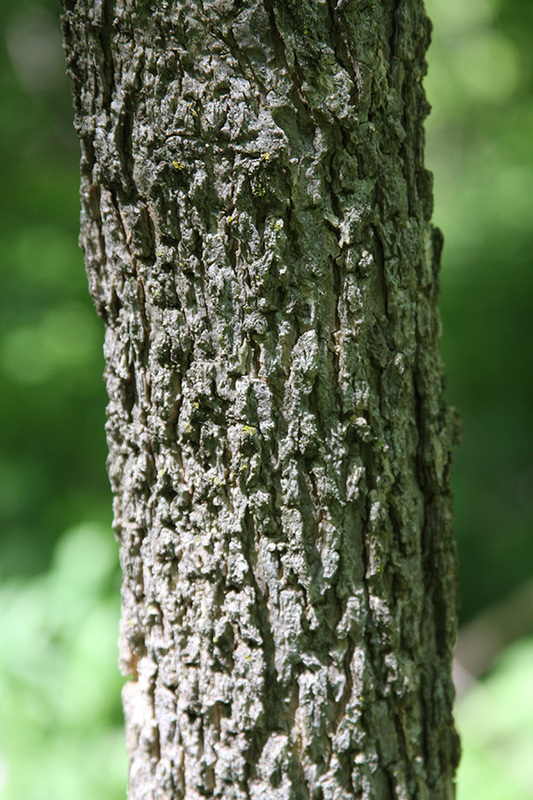 The bark on young trees is smooth and light gray with orangish streaks. As it ages it develops corky ridges that are soft to the touch and easy to rub off with the palm of the hand or indent with a fingernail. The twigs when young are stout, hairless, round or oval in cross section, and light green with prominent, raised, dark purple dots (lenticels). Older twigs are dull gray with light brown lenticels. The buds are bluish-black, small, cone-shaped, and covered with fine hairs. The terminal bud is ⅛″ to ⅜″ long, broad, and pointed. 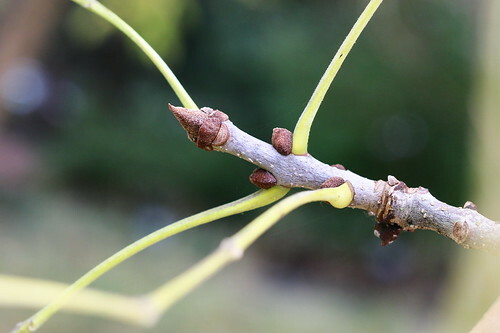 The terminal bud is distinctly separated on the twig from the uppermost pair of flowering buds. 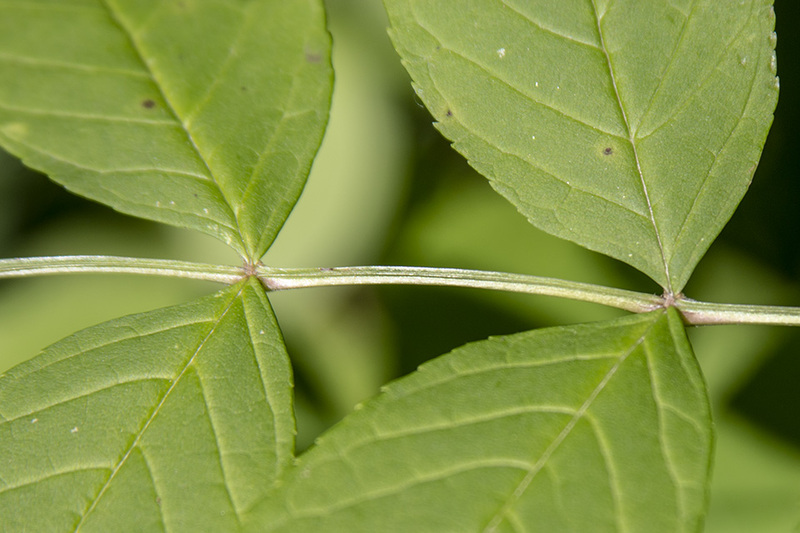 The leaf scars are elliptic to oval. 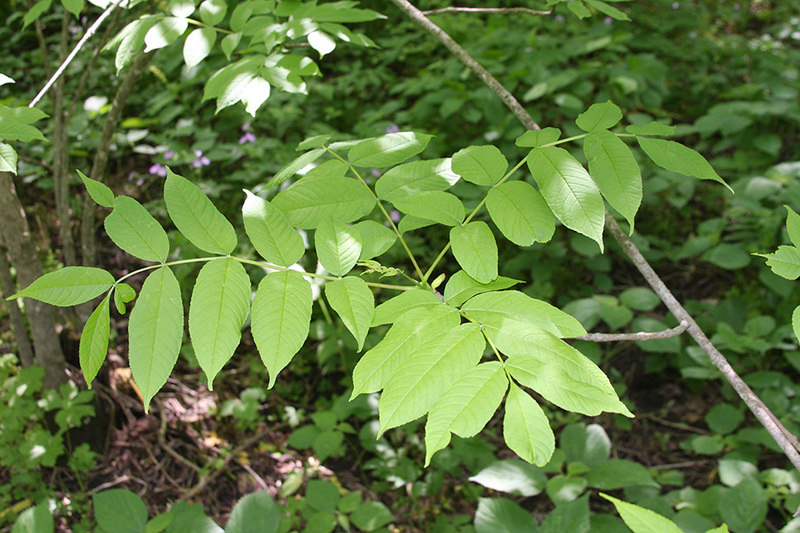 The leaves are deciduous, opposite, and pinnately compound. They are 9″ to 16″ long and are divided into 7 to 11, sometimes 13, leaflets. The leaflets are arranged in opposite pairs and 1 terminal leaflet. The lateral leaflets are stalkless. They are thin, firm, lance-shaped to oblong, 2¾″ to 5½″ long, and 1″ to 2″ wide. They are tapered or rounded at the base and taper at the tip to a long, slender point with concave sides along the tip. The upper surface is dark green and hairless. The lower surface is lighter green and hairless except for reddish-brown hairs along the midrib. There is a tuft of reddish-brown hairs where the leaflet attaches to the central leaf stalk. The margins are finely toothed. In autumn they turn yellow to reddish-brown and are shed as entire leaves. The tips of the leaflets tend to droop. A tree may have flowers with both male and female parts (perfect), only male flowers, or only female flowers. They are borne in small, dense clusters often near the ends of the twigs. They are purplish, small, and inconspicuous, and have no petals. They appear in late April to June just before or at the same time as the leaves. The fruit is a 1″ to 1¾″ long, ¼″ to ⅜″ wide samara consisting of a flattened seed case with a dry, flattened, papery, wing. The wing is broad, often twisted, blunt and barely notched at the tip, and extending to or almost to the base of the seed case. The seed case is strongly flattened, barely thicker than the wing. It contains a single seed. The samara ripens from June to September and is dispersed from July to October. 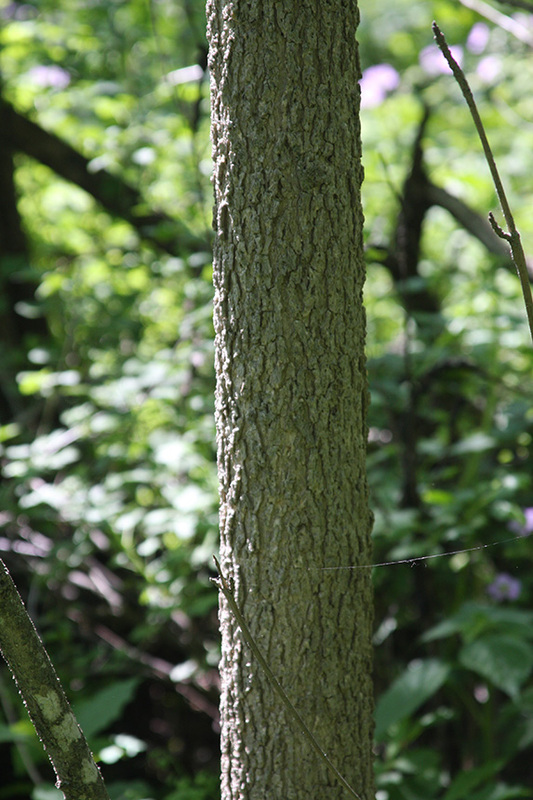 The champion black ash in Minnesota is on private property in or near Forest Lake, in Washington County. In 1998 it was measured at 65′ tall and 125″ in circumference (40″ in diameter). 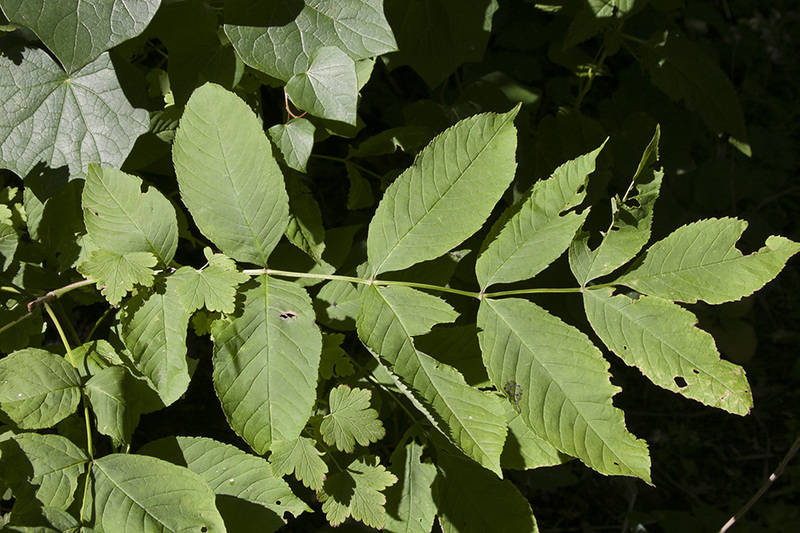 Blue ash (Fraxinus quadrangulata) twigs are 4-angled, or winged. The leaflets are on short leaflet stalks. 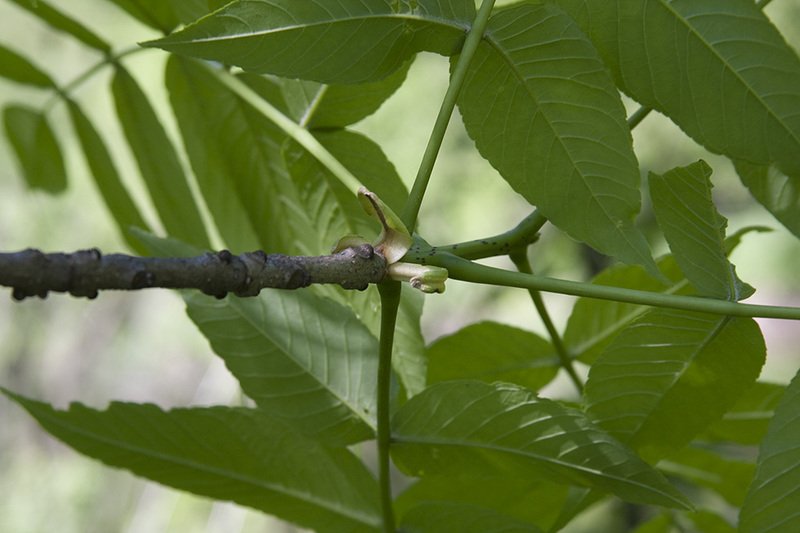 Green ash (Fraxinus pennsylvanica) first-season twigs are densely hairy, velvety. The leaf scars are half-round and are straight along the upper edge. The uppermost pair of lateral buds occurs at the base of the terminal bud. 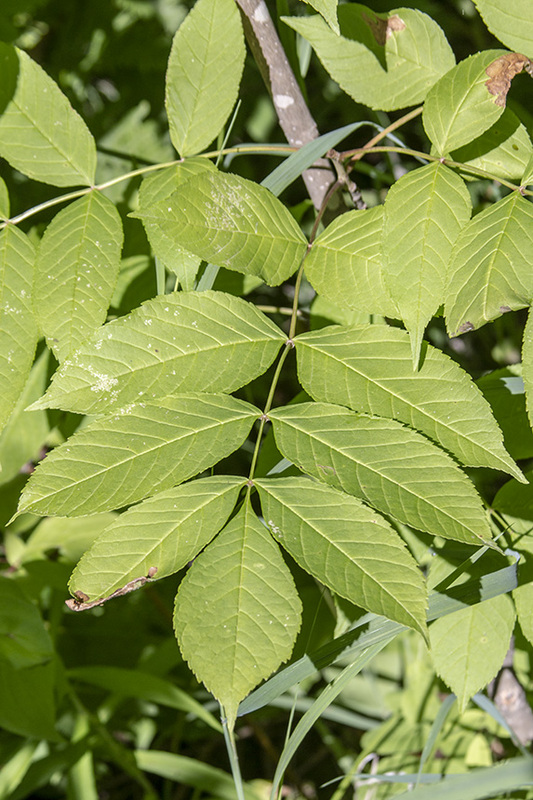 The leaves have 5 to 9, usually 7, leaflets. The leaflets do not droop. The wing of the samara extends to half or more of the seed case. White ash (Fraxinus americana) leaf scars are from top to bottom half-round, not elliptic to oval, and are deeply notched at the top. The uppermost pair of lateral buds occurs at the base of the terminal bud. 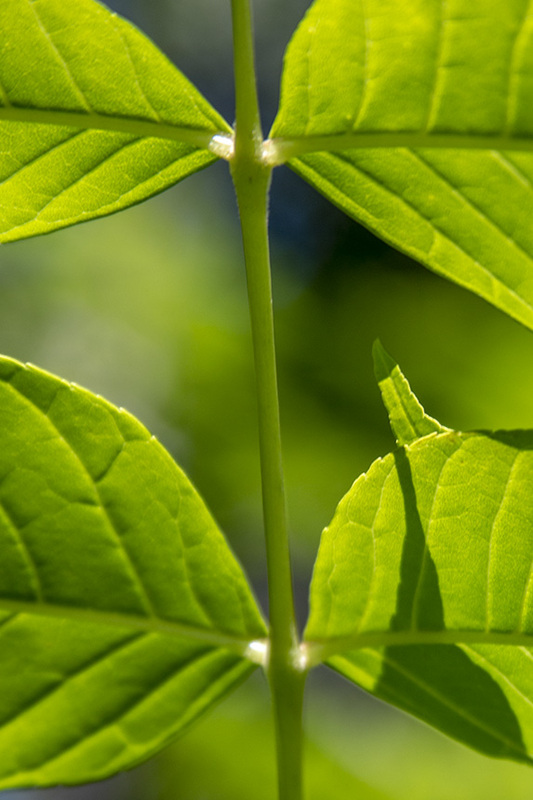 The leaves have 5 to 9, usually 7, leaflets. The leaflets are pale or whitish on the underside and are on short but distinct leaflet stalks. The wing of the samara does not extend to the base of the seed case. A dry fruit consisting of a seed attached to a papery wing; one seeded in Elms and Ashes, two-seeded in Maples. 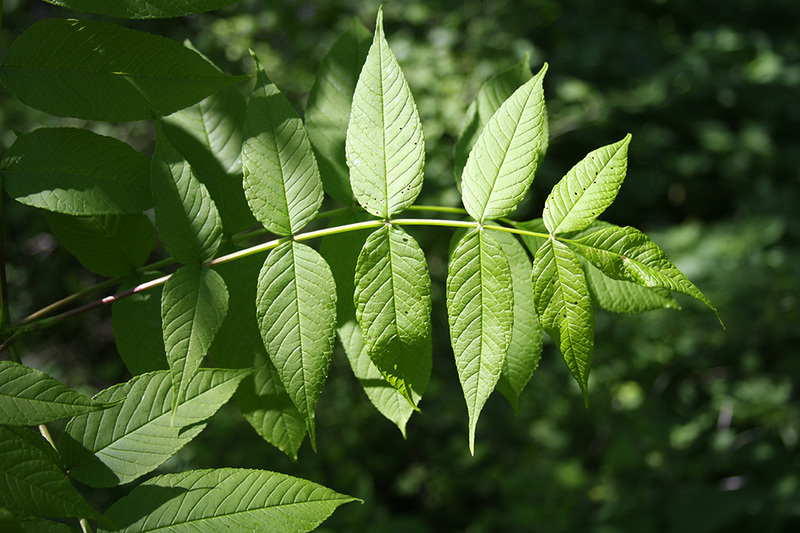 A tutorial of how to tell the America's 3 most common Eastern Ash trees apart. Fraxinus nigra (Black Ash) Fraxinus pennsylvanica (Green Ash) and Fraxinus americana (White Ash) can be confusing to tell apart to the average eye. This tutorial is designed to point out the main differences between the trees, so that after a bit of practice anyone can I.D. these trees in the field, or in their yard. 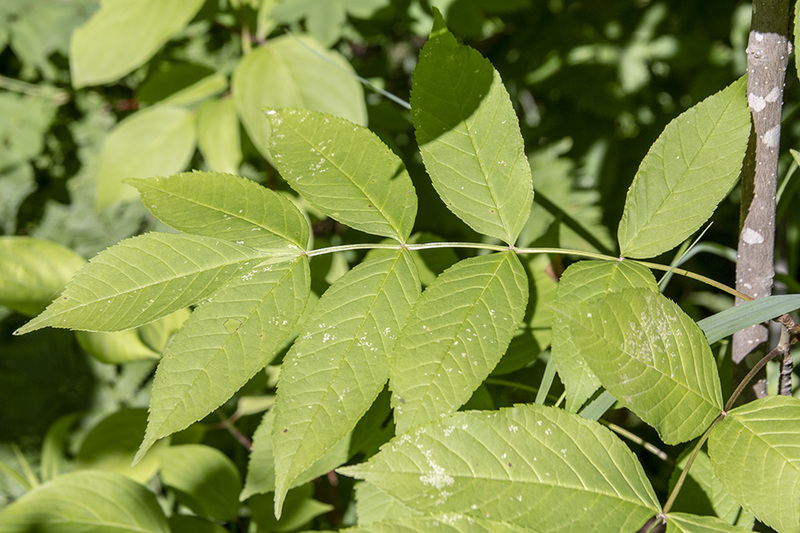 Knowing what kind of ash tree you have, or are dealing with may be especially important with the onset of Emerald Ash Borer and determining what value your ash trees may hold.